Abhinav Bindra’s Olympic preparation looks on track as the rifle ace shoots down back-to-back gold medals at the 39th InterShoot International Shooting Competition in Hague, Netherlands. 2008 Beijing Olympic gold medallist shot 205.6 on Saturday, beating Peter Hellenbrand by 0.8 point, despite an uncharacteristic 9.4 and 9.5 on his last two shots. In the first match of the competition, Abhinav Bindra and Rakesh Manpat made it a one-two for India. Rakesh was leading on the penultimate shot but a below par last shot on 9.0 as compared to Bindra’s 10.3 pulled him down to the second spot. Shriyanka Sadangi won the bronze in the Women’s 10m Air Rifle, after shooting the highest qualification with a score of 418.9 while Rio Olympic quota winner Apurvi Chandela finished 6th. In the 2nd match of the Women’s 10m Air Rifle, Shriyanka won the silver while Apurvi won the bronze. Pratik Borse also won back-to-back gold medals in the Junior Men’s 10m Air Rifle. Men’s 10m Air Rifle Match 1: 1. Abhinav Bindra 205.5 (624.2); 2. Rakesh Manpat 204.3 (620.3); 3. Thijs Theunissen (NED) 183.5 (617.9); 11. Prithviraj Mane 615.2; 21. Amit Raut 604.1. Men’s 10m Air Rifle Match 2: 1. 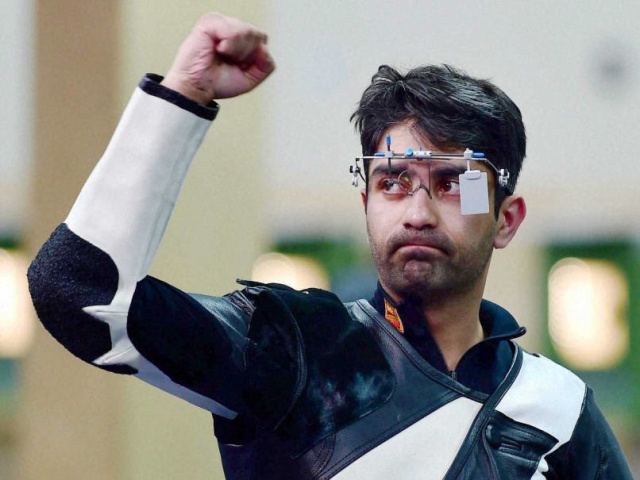 Abhinav Bindra 205.6 (623.9); 2. Peter Hellenbrand (NED) 204.8 (622.9); 3. Jack Bale 183.7 (619.4); 5. Rakesh Manpat 142.7 (624.1); 13. Prithviraj Mane 609.9; 16. Amit Raut 606.6. Junior Men’s 10m Air Rifle Match 1: 1. Pratik Borse 206.3 (619.7); 2. Emanuel Soderlund (SWE) 202.5 (611.1); 3. Benjamin Karlsen (NOR) 180.7 (615.5). Junior Men’s 10m Air Rifle Match 2: 1. Pratik Borse 207.4 (618.5); 2. Benjamin Karlsen (NOR) 204.7 (618.1); 3. Stefano Spek (NED) 182.8 (608.9). Women’s 10m Air Rifle Match 1: 1. Malin Westerheim (NOR) 209.7 (415.5); 2. Pea Smeets (NED) 207.4 (413.0); 3. Shriyanka Sadangi 186.1 (418.9); 6. Apurvi Chandela 122.9 (418.2). Women’s 10m Air Rifle Match 2: 1. Shimaa Hashad (Egy) 206.4 (415.2); 2. Shriyanka Sadangi 206.1 (414.2); 3. Apurvi Chandela 185.7 (420.0). Junior Women’s 10m Air Rifle Match 1: 1. Zumaya Goretti (MEX) 209.3 (416.5); 2. Mandy Mulder (NED) 207.5 (407.9); 3. Martina Kaiser (SUI) 185.4 (409.6); 4. Dilreen Gill 164.6 (413.8); 15. Aditi Singh 404.7. Junior Women’s 10m Air Rifle Match 2: 1. Zumaya Goretti (Mex) 205.3 (418.6); 2. Malin Stafas (SWE) 202.6 (411.0); 3. Hannelore Veraart (BEL) 183.6 (408.8); 6. Dilreen Gill 120.8 (413.4); 16. Aditi Singh 404.0.